Big Pharma is hurting the NHS [UK National Health Service] at its core – here’s what we need to do, if we’re bold enough. Last week NHS England published its spending on medicines for the past year which amounted to a staggering £20 billion. That’s an 11 percent increase from the previous year and a 55 percent hike since 2010. For anyone following news about the NHS, that £20 billion figure may seem familiar as it’s the same amount the government announced it would be injecting into the NHS in the recent autumn budget. Yet even with this financial boost, the drugs bill is still rising faster than the NHS funding to pay for it. One major reason for this is the price inflation of essential drugs. The extortionate prices being charged by big pharmaceutical companies are a financial drain on an already squeezed NHS budget. Yet at the same time, patients are being denied access to other effective drugs, even though they exist, because their price tag is just too high for the NHS. Dunise is a Scottish breast cancer patient, working with campaign group Just Treatment. She has not been able to access breast cancer drug, pertuzumab (Perjeta) in Scotland because it is too expensive. Her story is not unique, but with the NHS rejecting or rationing drugs because of price, it is becoming more widespread. After years of negotiations with the government, drug manufacturer Vertex is still not offering an affordable price for its breakthrough Cystic Fibrosis drug leaving patients unable to access an effective life-changing treatment. This financial burden is only going to increase as the first wave of new advanced cancer treatments called CAR-Ts – that reprogram the body’s own immune cells to attack malignant cells – are priced in the region of several hundred thousand pounds. The U.S. list price for Yescarta (CAR-T cell therapy for untreatable forms of blood cancer) is $373,000. The UK price is confidential but the therapy was rejected by NICE, the body which decides whether the NHS can afford a drug, in August. High drug prices hit patients the hardest and hurt the NHS at its very core. Though we treasure the principle of public healthcare for all, free at the point of use, this is undermined by our system of privatised medicines. We have to question what is going wrong. Big pharmaceutical companies defend high prices by claiming that they need to recoup their huge research and development (R&D) costs, but often there is little transparency around these costs. Many of the big pharmaceutical companies are spending while others are spending more on marketing than on R&D. Also much of the early stage, riskier research that leads to breakthroughs is publicly funded. Some estimates say that between one-third and two-thirds of all global spend on R&D comes from the public. So what can be done about this? We need to move away from the current business model that prioritises short-term shareholder value and relies on financialised practices such as share buy-backs. It’s a corporate-driven model where decisions are made based on profit and financial returns not on public health need and patient access. This model does not treat health as a human right and is not delivering the health innovation that we need and even when it does, it’s at prices that governments can’t afford. Instead, as we explored in a recent report with University College London, STOPAIDS and Just Treatment, we need bold reforms to re-orientate the whole model so that the public have greater democratic control over our pharmaceutical system and where the incentives are radically changed. Right now, the industry is incentivised to develop new drugs by high prices. This could be changed so that innovators are rewarded with upfront innovation inducement prizes rather than patent-based monopolies. The prizes would include stipulations that the technology would be freely licenced to enable different manufacturers to compete and bring prices down. The public sector makes significant contributions to R&D but publicly-funded breakthroughs often get licensed to private companies, which then set high prices and extract excessive profits. Taxpayers pay twice, first for the research and then in high prices. In 2016,the NHS spent £1 billion on drugs in 2016 where public money had funded their research and development, and yesterday’s figures show this has risen to £1.3 billion. In order to ensure public returns from public investment, conditions should be attached to public funding. These conditions should stipulate that drugs based on publicly-funded research should be affordable and accessible. Something that the UK government could do today would be to issue crown use licenses on drugs whose prohibitive pricing creates patient access problems. This allows other companies to produce such drugs and enables lower prices. The right to do this is enshrined in a WTO global agreement on intellectual property and so the UK government should use all tools available to push for patient access on vital medicines. Extra money going into the NHS (itself subject to review if no Brexit deal is reached) will provide some much-needed breathing space to a cash-starved NHS, but not if the money is siphoned off to big drug companies through charging extortionate prices. Doing nothing is not an option. The financial cost to the NHS is unsustainable and the human cost of denying access to medicines is inexcusable. It shouldn’t take the shock of Brexit for politicians to act. Heidi Chow is pharmaceuticals campaigner at Global Justice Now. Paradoxically, the drop that broke the camel’s back, according to Ngurumo, was “the response by the EU missions on recent homophobic campaign orchestrated by a Dar es Salaam demagogic regional commissioner”, from which the government had immediately disassociated with official note. After that, even the ‘boisterous’ regional commissioner asked human-rights defenders and people from countries where homosexuality was legal, to “understand, that we as a nation have our own laws, Constitution and norms. In Dar es Salaam being gay is not a right. It is a criminal offence”. Paradoxically, homophobia is the only subject on which all African populations agree and on which, in any case, Tanzania had so far kept a low profile, while in other countries such as neighbouring Uganda homosexuality is subject to death penalty. Paradoxically, in the highly advanced US and EU, lawyers are engaged on a daily basis in asserting the civil rights of people who show a sexual orientation different from what is defined as ‘normal’ in the Gaussian distribution curve. This is the second article in a series on Tanzania. 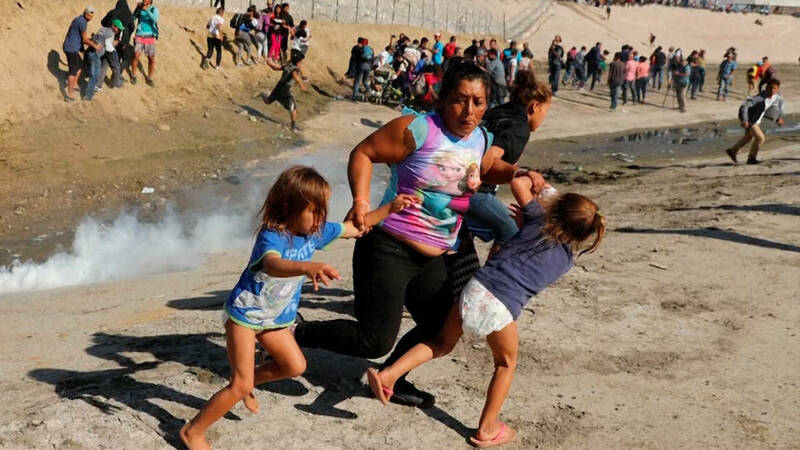 In Tijuana, Mexico, U.S. border patrol officers fired tear gas Sunday into a crowd of desperate Central American asylum seekers as they tried to push their way through the heavily militarized border with the United States. Among those attacked were mothers and small children, who were left gagging and screaming as tear gas spread. Mexican federal police officers in riot gear moved in and arrested dozens of the migrants; Mexico’s government says they’ll be deported to Central America. The group had broken away from a peaceful protest of thousands of migrants demanding entry to the U.S. where they hoped to win asylum. The migrants are from Honduras, Guatemala and El Salvador, and are fleeing widespread violence, poverty and mass unemployment. This is 37-year-old Honduran asylum seeker Saúl Hernández. Mexico has asked the U.S. to investigate the use of tear gas on children. Speaking from Mississippi Monday, Trump defended the tear gassing for a second time and placed the blame on parents of migrant children, suggesting that some people with children aren’t guardians but so-called “grabbers” who simply use the children to gain asylum. In Budapest, a conference and workshops on the topic of unconditional basic income, organised by UBIE and its partners in Hungary, took place on the weekend of 23-25 November. At the conference on Friday 25th, experts, politicians and specialists spoke about their ideas, suggestions and experiences. After each round of discussion the audience could ask questions or share their comments. (Detailed programme in English can be found here). At the workshops on Saturday and Sunday the 24th and 25th, the idea and feasibility of a European Citizens’ Initiative were further developed, as well as possible strategies for the upcoming European elections in May 2019. Unconditional basic income: an unconditional basic income (UBI) is an income which is granted unconditionally to all members of a political community on an individual basis without proof of need and without obligation to work. Unlike many other existing minimum income schemes in European countries, UBI would universal, individual, unconditional and high enough to ensure an existence that preserves personal dignity and enables individual active participation in society. Eurodividend: The Eurodividend would be a cash payment, of for example 200 Euro per month on average, to every EU resident. This payment would be free of consideration, so there would be no obligation to work, and it would be made without proof of need. The main difference between the Eurodividend and an unconditional basic income is that the amount of the dividend would not be sufficient to secure one’s livelihood. A “compromise solution”: the EU should pay each EU resident a basic income, measured by the subsistence level of the poorest country in Europe. According to statistics, this is Bulgaria, the amount would be about 135 euros per month, which would then be supplemented by each state accordingly to reach the respective subsistence level. Pilot projects: the EU should carry out pilot projects with the unconditional basic income in order to collect more data. EU child benefit: which would, in principle, be a Eurodividend for persons under 18 years of age. The final decision on the proposal to be presented as a Citizens’ Initiative to the EU Commission will be taken at the next general assembly in Brussels in spring 2019. Stockholm23 Nov – 19.30-20.10 (CET) Award presentation at the Vasa Museum. The event is live-streamed on the Foundation’s website, live signal is provided to interested media. The Award presentation is followed by a dinner and Laureates’ acceptance speeches. With the European Elections of May 2019 on the horizon, the Unconditional Basic Income Europe Network is bringing together ideas for a new European social contract that binds countries and citizens in solidarity, while preserving individual freedom and dignity. With the inputs and thoughts of academics, campaigners and active politicians, the network will explore how the idea of a Universal Basic Income could transform the European Union and which steps can take us closer to the realisation of that idea. NEW YORK (IDN) – “I love you, that’s why I beat you.” So ends a poem by the Ghanaian writer Mariska Araba Taylor-Darko about a violent spouse and an abused woman who lays the blame of the daily beating on herself. The poem, A Beating for Love, takes special significance, particularly as this year’s UN theme for the International Day for the Elimination of Violence against Women (November 25) and the 16 Days of Activism Against Gender-Based Violence (November 25-December 10) – “Orange the World: #HearMeToo” – aims to support women and girls around the world. Violence against women and girls, one of the most widespread, persistent and devastating human rights violations in our world today, remains largely unreported due to the impunity, silence, stigma and shame surrounding it, says the UN on its webpage “end violence day”. The reality of domestic violence is a plague that affects millions of women, often trapped in a toxic environment they cannot escape. According to the United Nations Statistics Division, intimate partner violence accounts for the majority of women’s experience of abuse. Similarly, in the U.S., around 4.5 million women say they’ve been threatened by an intimate partner with a gun and 45 percent of women who are murdered are killed by intimate partners, according to Everytown for Gun Safety. As of this year, 41 African countries had ratified the ‘Protocol to the African Charter on Human and People’s Rights on the Rights of Women in Africa’, adopted in 2003. Yet Clarence Mwombeki from Door of Hope for Women and Youth Tanzania, addressing the recent NGO Forum in Banjul, pointed out that African women continue suffering despite the protocol in place for almost 15 years. A report released by the Watson Institute of International & Public Affairs at Brown University indicates the total sum spent on the “war on terror” is much larger than previously suggested. Professor Neta C. Crawford, the author of the study, revealed that the US government is set to spend nearly $6 trillion on post-9/11 wars by the end of the 2019 fiscal year. In March, the Department of Defense (DoD) released a report stating the military had spent $1.5 trillion on the wars. However, the Brown University report notes the DoD’s numbers were a conservative estimate that also failed to take into account spending across other federal departments. The new estimate not only includes expenditures from the Department of Homeland Security (DHS), budget increases, and medical costs for veterans, but also interest on money borrowed to pay for the wars. Including indirect war spending, the total amount of spending allocated since 2001 will be $4.6 trillion by the end of 2019. The report also estimates the government will be obligated to spend around $1 trillion for the future care of post 9/11 veterans until 2059. The total sum amounts to a staggering $5.993 trillion. The study warns that continuing the multitude of US war and interventions for another four years would cost an additional $808 billion, even if the United States were to stop such actions by 2023. The accumulated costs would likely exceed the estimated $6.7 trillion because the number of veterans will continue to grow as long as the US continues military operations. With no end in sight, the fiscal and human cost of US wars of aggression will continue to climb. A particular concern introduced in the latest study was the US government’s reliance on deficit spending and borrowing to fund war. In 2011 it was calculated that war appropriations, if capped at $1.5 trillion, would accrue $7.9 trillion in interest. War spending has substantially increased since the estimate, and more debt accumulated, so this would only be a conservative estimate. The larger $5.9 trillion estimate over three times more than the Pentagon claimed has been spent out of war-related appropriations since 9/11. The DoD estimated $1.7 trillion would be spent by the end of the 2018 fiscal year, but this lower estimate only contains a portion of all war-related budgeting and spending. The spending allocated by Congress is not included in the Pentagon’s estimate. Congress passes budgets that increase spending on other war-related areas, particularly “overseas contingency operations (OCO).” OCO spending directly supports the American empire’s global military operations. Along with the DoD, Congress has allocated over $2 trillion in OCO spending since 2001. In addition to the unfathomable sums of money spent, the study estimates 370,000 lives lost from direct combat with many times more lost due to indirect consequences such as malnutrition, damaged infrastructure, and environmental degradation. Approximately 200,000 innocent civilians have been killed as well. Professor Crawford personally notes even these estimates are limited with many more likely killed due to US imperialism. The number of veterans from the “war on terror” is also set to increase significantly. The Department of Veteran Affairs estimates the number of veterans will rise to 4.3 million by 2039. Many will return from combat severely injured or suffering mental illness, increasing the fiscal and societal toll. The wars in the Middle East have created the largest humanitarian crisis since World War II with over 10 million refugees forced to flee their countries. Combined with the obscene amount of money spent, the wars waged by Washington and its allies highlight the crisis of capitalism. The ruling classes see no way forward other than war, but it means ruin for working people and society as a whole. “The more we do together, the less time we have to fight each other,” says Bernard Weber the initiator of the 7 Symbols of Peace campaign. It’s a campaign designed to unite the world in a collective voice that says our planet must be a peaceful, shared community. To spread the message, Weber is levering his own digital platform for a global vote to elect the seven symbols that best signify peace. Tourism is one of the world’s largest industries, he points out, with a global economic contribution (direct and indirect) of more than seven trillion US dollars. It involves transport, accommodation, hospitality and sight-seeing and emerging countries are increasingly reaping the economic benefits of the industry. “What’s the most popular air route in the world?” Weber asks. Some might answer New York to Paris. Others would guess Beijing to Shanghai. In fact, it’s the domestic flight between Seoul and Jeju, the South Korean island that was elected one of the New 7 Wonders of Nature in 2011. Last year, almost 65,000 flights made the trip between Seoul and Jeju. Most of the tourism is domestic but there’s been a significant rise in Chinese visitors due to Jeju’s visa-free entry requirements. In a region overshadowed by the threat of nuclear conflict, Weber sees the coming together of peoples in pursuit of happiness as one of the great positive stories of our time. Yes, he is aware of the dangers of what’s called “overtourism”, but he’s always urged the custodians of the sites that have been elected as members of the New 7 Wonders canon to preserve their heritages and foster sustainable tourism. “We need to turn up the volume of the voice of the people so that the powerful can hear that we want peace,” says Weber, an admirer of the idealism that launched the Campaign for Nuclear Disarmament (CND) in the 1950s in Britain. On 6 June, the CND symbol, one of the most famous international symbols of peace, visited Manchester as part of its 60th-anniversary tour across the UK and Bernard Weber marked the occasion by presenting a colourful flower version of the symbol to the organizers in the English city. Peace cannot be achieved by any one person or group, but the 7 Symbols of Peace campaign is providing a digital platform for everyone who wants to add their voice, and symbol, to the debate. Bernard Weber is the founder of the New7Wonders worldwide movement for empowering people to participate in global democracy. More than 600 million votes have been cast in the three New7Wonders elections to date.